WELCOME TO MY TEAM AK FUNDRAISING WEBPAGE! We are raising funds to make a difference in the lives of people living with epilepsy. As many of you know, I was diagnosed with epilepsy 5 years ago. After a tough year, and several months of not being able to control my seizures in 7th grade, I am now 2 years seizure free thanks to Boston Childrens Hospital and all the support from my family and friends! I am finishing up my freshman year of high school, having competed on my school's football and basketball teams. We are raising money to help other families who are struggling with caring for or living with epilepsy. I am fortunate to be under the care of one of the best pediatric epilepsy doctors in the country in Dr Pearl at Boston Childrens hospital, but we realize that not everyone may be as lucky. 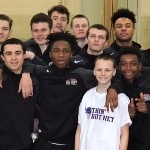 On June 16th, we are hosting the Athletes vs Epilepsy Nothin But Net fundraiser 3 on 3 tournament and raffle at the North Andover Youth Center. We will be holding a raffle for great prizes, including a family membership to the Merrimack Valley YMCA for a year, an afternoon at the Youth Center for you and your friends, and many other awesome prizes. This will be a great community event with some 3 on 3 basketball, a dj spinning the music , an awesome raffle, and great snacks at the concession stand! We will also have information about epilepsy and first aid for a seizure on hand. Please come down and support the tournament or if you are unable to make it, you can make a tax deductible donation on this page. The mission of the Epilepsy Foundation is to lead the fight to overcome the challenges of living with epilepsy and to accelerate therapies to stop seizures, find cures, and save lives. Please consider supporting this cause by making a safe and secure donation to my fundraising webpage. Giving to the Epilepsy Foundation means you make the world a better, easier, more manageable place for the 3 million people in the U.S. who are living with epilepsy and seizures.